The sound of bells jingling as he walked down the halls gave him away. The children of St. Mary’s Home knew there was a very important person in the building. 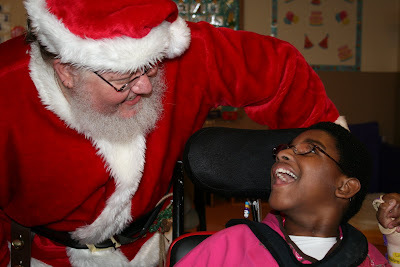 Santa visited several classrooms to chat with the children and spread some holiday cheer. Santa is Ross Wilkins, a database programmer for technology and defense contractor SAIC. Wilkins and several colleagues, including St. Mary’s Trustee Carl M. Albero, dropped off presents for the children and a gift package for the staff. This was Wilkins’ second December in a row touring St. Mary’s while dressed up as Santa. And yes, the beard is real.